Wow I feel everything with a noticeable heightened sensitivity. This includes emotions, muscle pain, sense of smell, hearing, and taste. My nose is so sensitive to smells I am ALWAYS saying "it smells like ___ in here", or whoa, it smells SO strong. My emotions are crazy, sometimes I think this is what it must feel like to be pregnant. I cry at the drop of a hat, I'm offended easily, and sometimes I am so happy I feel like I'm going to burst. I actually care what people think about me, I know those of you who know me are now saying, who are you and what have you done with Kelly? This 'feeling everything' thing can be extremely overwhelming at times, but I've never felt something so amazing. I've been learning that there are things I thought I liked that I really don't like and things I like that I never knew I did. I'm learning how to socialize and be myself with friends and family without the crutch of alcohol. I learned that waking up on the weekend without a hangover, having a cup of coffee, and going for a run is exactly what I want to be doing. I'm learning that person who was under the cloud of constant alcohol black outs for the last several years was not me. I am not the stupid embarrassing things I did, I am a real person who does not mix well with alcohol. I had been trying and failing for years to regulate my drinking. I'm only going to drink two, ok three, just on the weekends. It never worked and I finally figured out why - I'm not a person who can ingest alcohol. It started out as a fun, social thing for me years ago, but last year I realized that it wasn't fun anymore. In fact it was the root of any type of problem I had. Bad things happened to me when I drank and I should have wanted to stop sooner than I did. When actively drinking my life was a hot mess and I was comfortable that way. I fought through the scary first days and months of not drinking and now being sober is my normal. I'm so glad it is. Bad things would happen in the past and I always felt like it was the end of the world and drinking was the answer to everything. Now, I feel more prepared if something bad were to happen, I am able to handle it in a healthy way. Additionally, less bad things have happened since I stopped drinking alcohol which was the cause of many problems in the past. I am now present and thankful for each day. I'm positive I have been sabotaging my romantic relationships for a long time. Why? Now that might take years to find out, but the drinking just helped fuel this problem. It supported, encouraged, and justified bad decisions of all kinds, especially those related to men. What I didn't realize until the drinking stopped was that I am capable of being in a normal relationship and I do in fact, deserve to be loved. You see, I had this way of thinking that since I was fucked up, I was meant to be in a fucked up relationship. Now I know that is crazy talk. I am lucky enough to be in a loving, healthy relationship with an amazing man who has helped show me that I deserve all the love in the world and I am finally starting to believe him. This is a big one for me. Obviously when you stop drinking or doing drugs you probably need to change some friends you hang out with. I definitely had to do this and I realized just how little I had in common with some people. I also realized that I had friends that were completely different from me, without the same goals and outlook on life. It felt all too fake. When you make a big life decision like admitting you have an alcohol problem and decide to to stop drinking, you really find out who your true friends are. There are those who will love you unconditionally, those who won't bat an eyelash, and those who will still offer you cocktails after they already know you don't drink. I've encountered all of the above. Getting rid of my toxic friendships along with my toxic habits just makes sense and I'm learning not to feel bad about it. Stopping a nasty habit like alcohol abuse can bring out a lot of guilt, shame, and regret. I'd be lying if I said I haven't felt all of the above at times. However, I am realizing feeling all the emotions I spent years trying to numb is actually a beautiful thing. Not only am I learning to feel them, I'm learning how to deal with them, and live a healthy and successful life. I have made mistakes along the way and I will never be perfect. Every day I have to make a conscious decision not to beat myself up. I am a work in progress and I have come a LONG way. There are good days and bad days. Sometimes I feel like life isn't fair and I wish I could just drink alcohol normally like everyone else. Mostly, I have accepted that this is the way my life is, kind of like having five knee surgeries, quitting alcohol has become one of my stories of perseverance. 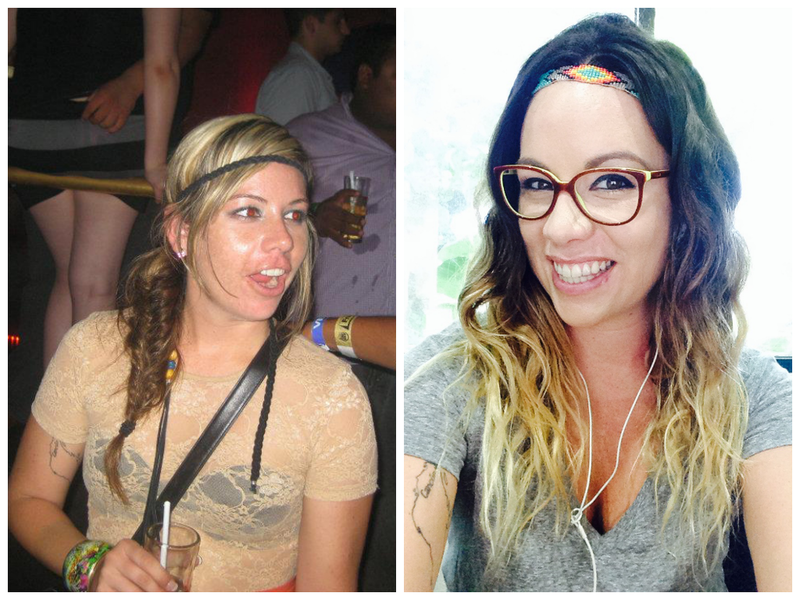 I never thought that sobriety would be my preferred way of life, but now I can't imagine going back to my party girl ways. I never dreamed I would feel SO happy, full, and healthy living a life without drugs and alcohol. I was always that girl who needed alcohol to have fun and now I am a testament to the fact that you don't need it to enjoy yourself. I wake up every day feeling relieved that I never have to feel hungover. I hope that by sharing my story other party girls (and boys) will have the courage to put down the drink and live the life they have always imagined. The best is yet to come.